The Sands Hotel offers 46 guest rooms, including two suites and one presidential suite – each with a unique personality. 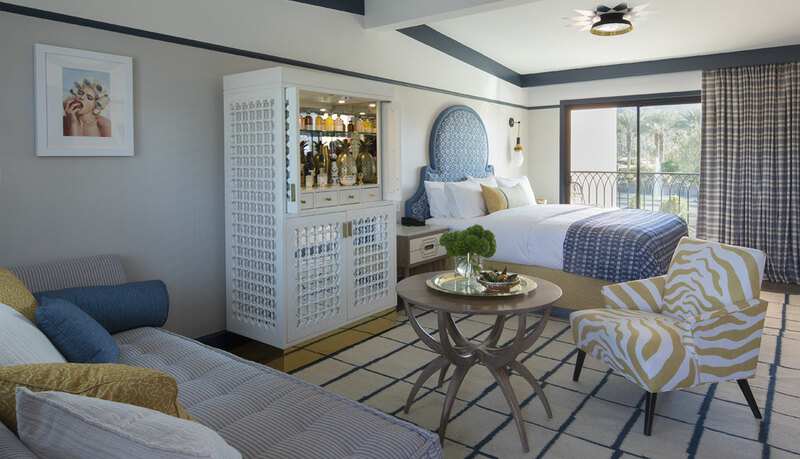 Using a series of different color combinations, bespoke furniture, and custom textiles, Martyn Lawrence Bullard provides each guest with an individual and unique experience. Each guest room features Acqua di Parma bath amenities, full-size in-room mini bars with vintage crystal stemware, Waterworks brass fixtures, Revival New York bed linens, Carrara Marble counter tops, an in-room entertainment system designed to work with guest’s personal entertainment devices and services such as Spotify, iTunes and Netflix. 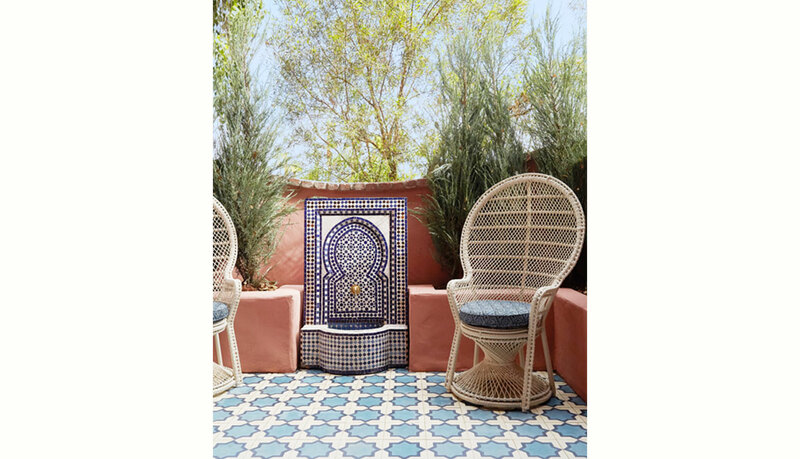 Many rooms feature a private patio or balcony, many with custom Moroccan fountains. 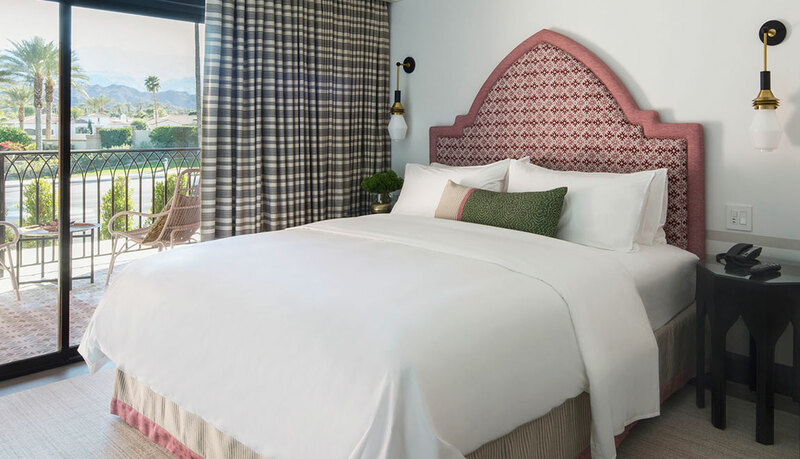 The Classic King guest rooms are located throughout the property, both on the first and second levels with some having views of the palm tree lined Santa Rosa and San Jacinto Mountain landscape. 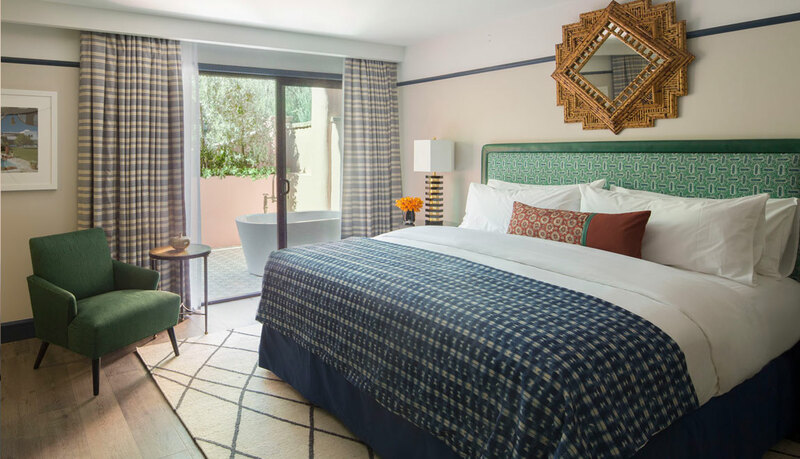 The rooms feature one plush king bed, Acqua di Parma bath amenities, full-size in-room mini bars with vintage crystal stemware, Waterworks brass fixtures, Revival New York bed linens, Carrara Marble counter tops, and chrome cast television service. Each guest room features approximately 300 square feet of living space. Only some classic rooms feature a patio or balcony. To ensure that you have a balcony or patio, we strongly encourage guests to reserve a Superior or Deluxe room type. Along with a premium location, the Superior King guest rooms are slightly larger than our Classic King guest room and feature a balcony or patio with plush outdoor seating. The Superior King guest rooms are located throughout the property, both on the first and second levels with some having views of the palm tree lined Santa Rosa and San Jacinto Mountain landscape. 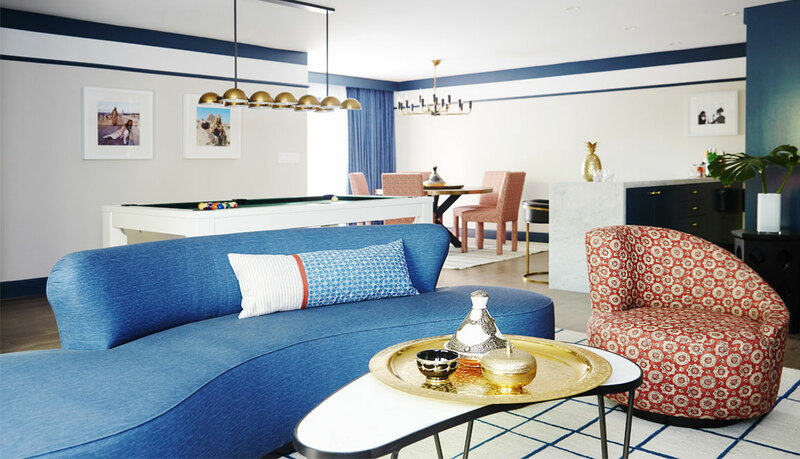 The rooms feature one plush king bed, Acqua di Parma bath amenities, full-size in-room mini bars with vintage crystal stemware, Waterworks brass fixtures, Revival New York bed linens, Carrara Marble counter tops, and chrome cast television service. Each guest room features approximately 325 square feet of living space. The Deluxe King guest rooms are much larger than both the Classic and Superior guest rooms. 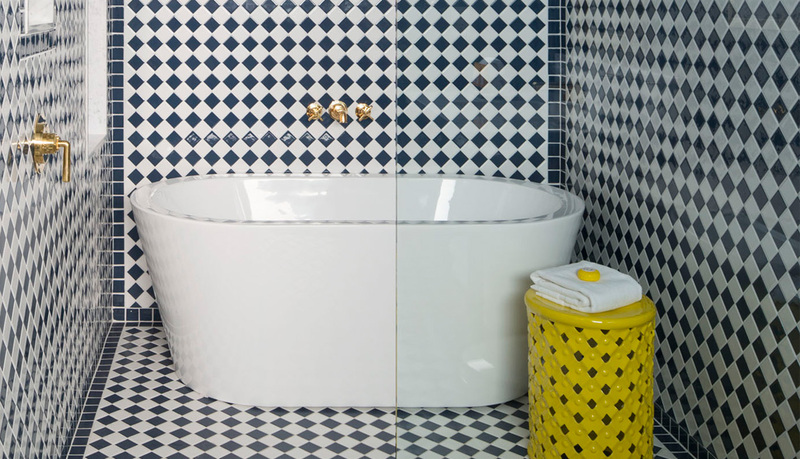 The Deluxe guest room features our signature oversized bathroom complete with separate bathtub. 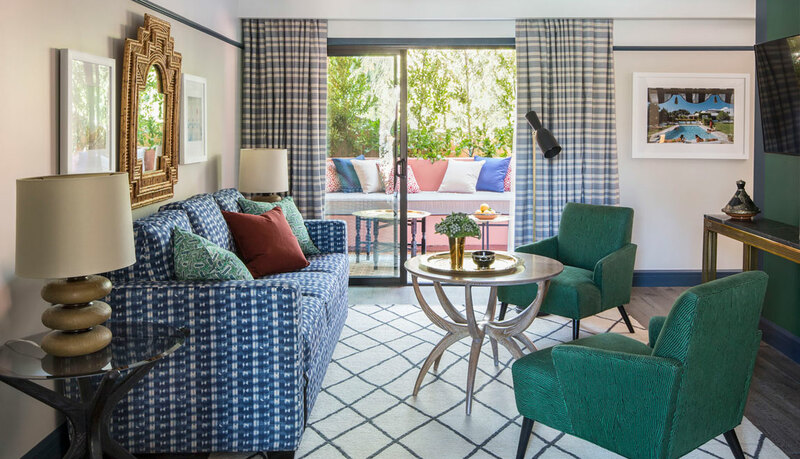 The room also features a separate seating area with a custom sofa lined with Moroccan textiles and full in-room bar. The Deluxe Rooms are located throughout the property, both on the first and second levels with some having views of the palm tree lined Santa Rosa and San Jacinto Mountain landscape. 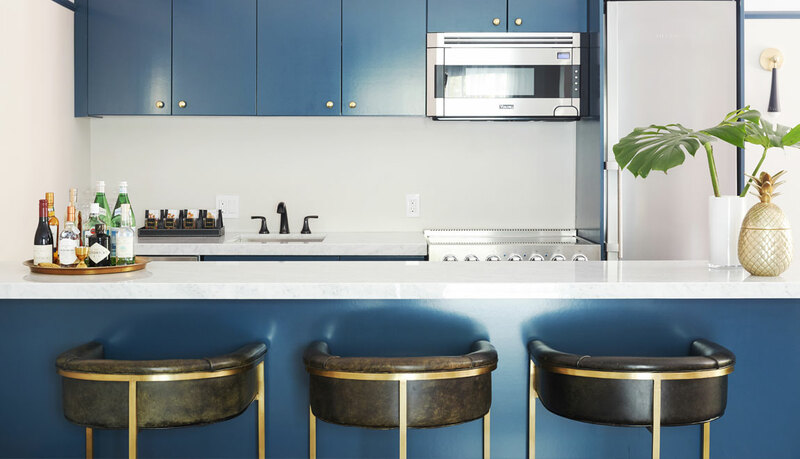 The rooms feature one plush king bed, Acqua di Parma bath amenities, full-size in-room mini bars with vintage crystal stemware, Waterworks brass fixtures, Revival New York bed linens, Carrara Marble counter tops, and chrome cast television service. Each guest room features approximately 350 square feet of living space. The Double Queen guest rooms feature two queen beds and are located throughout the property on both the first and second levels with some having views of the Santa Rosa and San Jacinto Mountain landscape. 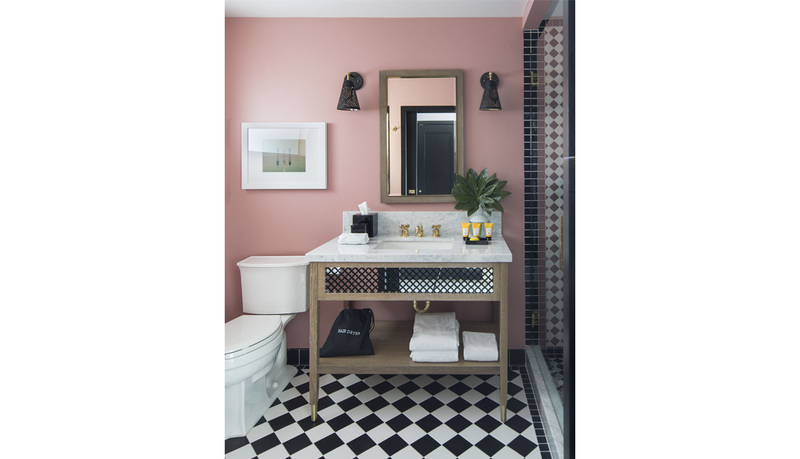 The rooms feature Acqua di Parma bath amenities, full-size in-room mini bars with vintage crystal stemware, Waterworks brass fixtures, Revival New York bed linens, Carrara Marble counter tops, and chrome cast television service. Each guest room features approximately 325 square feet of living space. 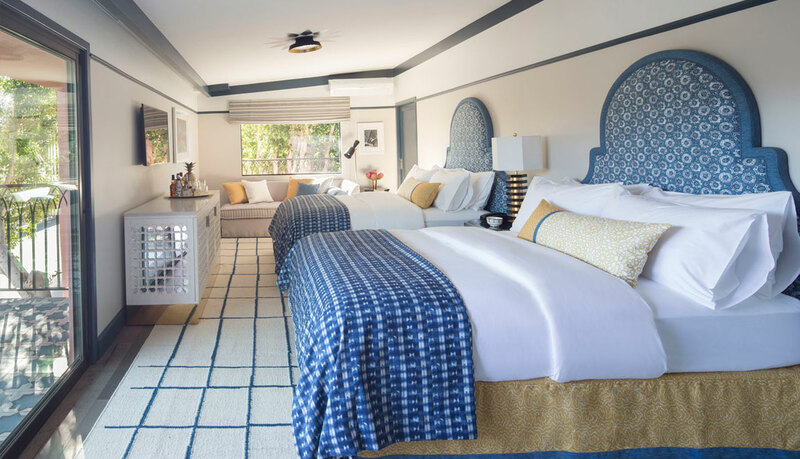 With the exception of Le Riad, which is the hotel’s presidential suite, our Junior Suites are the largest guest rooms on the property. They are approximately 400 square feet and feature a large living area and oversized outdoor patio, plush outdoor seating and outdoor bathtub. 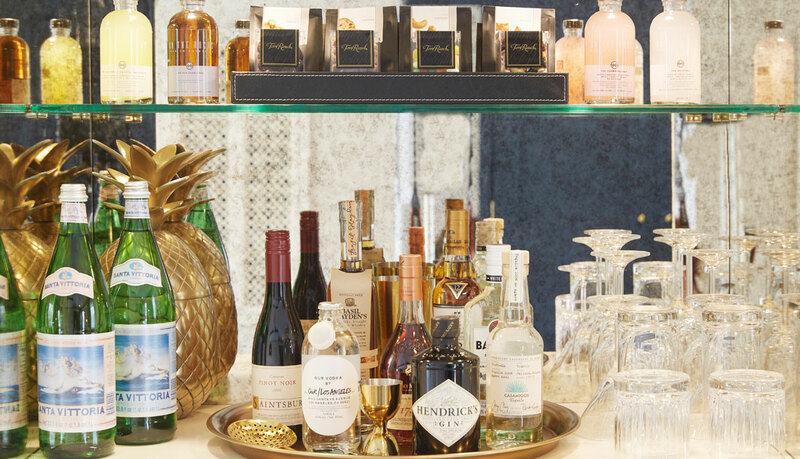 The Junior Suites have a full size dedicated wet-bar complete with vintage crystal stemware. 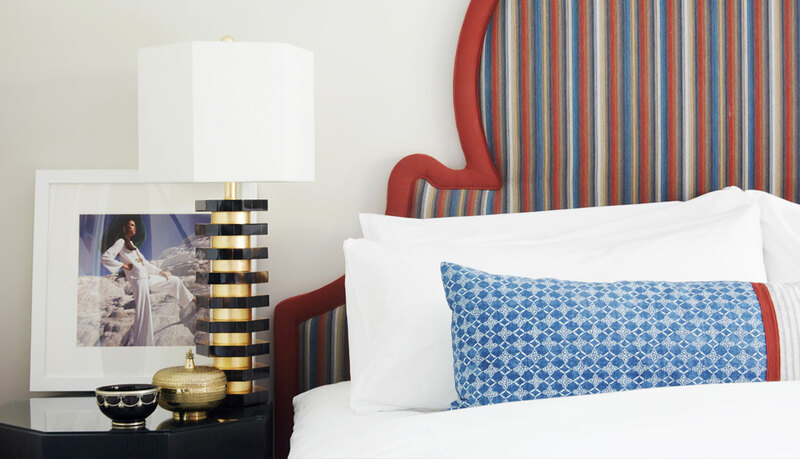 Both Junior Suites have a signature color pattern making each room individual and unique. 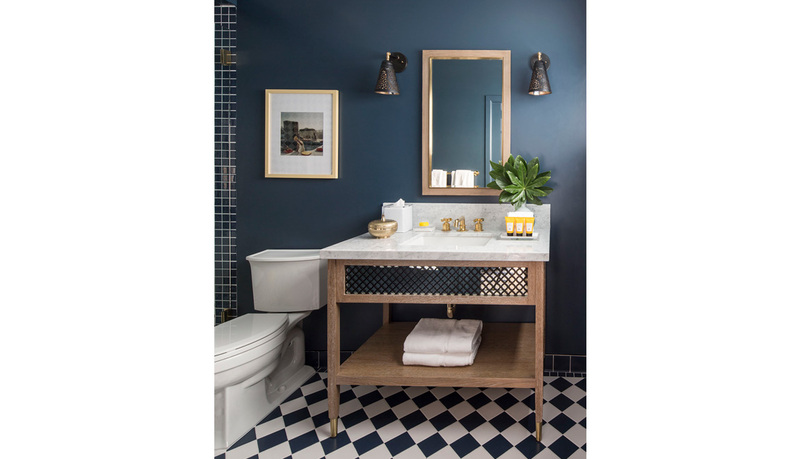 The rooms feature Acqua di Parma bath amenities, Waterworks brass fixtures, Revival New York bed linens, Carrara Marble counter tops, and chrome cast television service. Le Riad is the hotel’s highest level suite. A riad is a traditional high-level palace in Morocco, typically reserved for royalty and the elite class. This suite is as spacious as it is exotic. 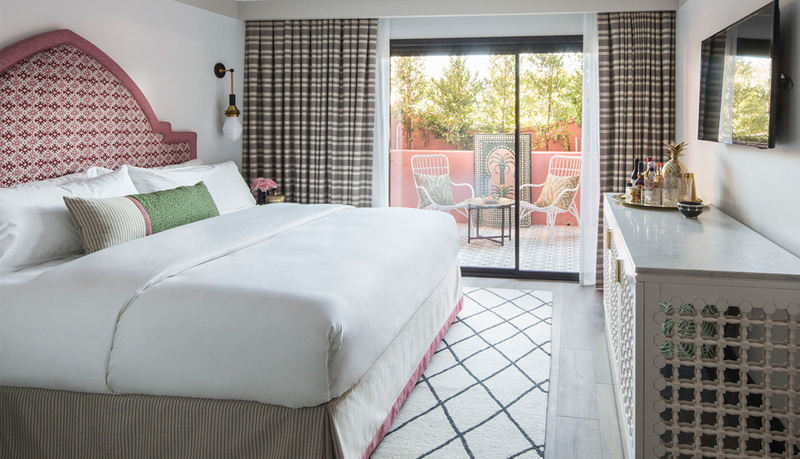 The suite is two stories and features 2 large outdoor patios, 1 balcony, full size kitchen with Viking appliances, Acqua di Parma bath amenities, billiards table, professional dressing/makeup vanity, and an in-room soaking tub at the foot of the bed in the master bedroom. Le Riad has approximately 1,000 sf of living space and is perfect for entertaining and small event gatherings taking place at the hotel.